Saraya Bandar Jissah ... an artist’s perspective. 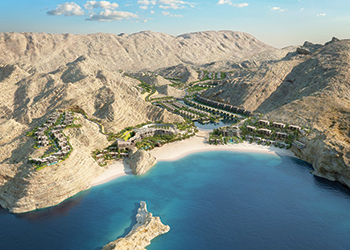 Construction of Saraya Bandar Jissah, a $600-million mega tourism project in Oman, is on track with rapid progress being made on site, the developer has revealed. More than 2,500 workers from companies including Carillion Alawi, Leighton Middle East, Towell Construction, Ghantoot Transportation and General Contracting (GTGC), Bumi, Drake & Scull and Wolf, are currently on site. Developed in partnership between Omran and Saraya Oman, the project is located on the outskirts of the capital Muscat and is surrounded by the Hajar mountains. It comprises five residential zones, a recreational facility, staff accommodation and two five-star hotels to be operated by the Dubai-based Jumeirah Group. Within a site area spanning 2.2 sq km, the development will feature 398 residential units in the five zones – Zaha, Nameer, Wajd, Na’eem and Safa. In terms of overall site infrastructure works, Carillion Alawi is currently laying down the services network and has achieved more than 60 per cent of the overall completion. All networks will be commissioned and ready for final connections to external services in Q1 2016. On the beachfront, Leighton Middle East is advancing its progress on the construction of the two hotels, one of which will be a resort and the other a boutique hotel. The resort’s exterior structure is nearly complete and overall it is more than 20 per cent complete. Meanwhile, construction of the boutique hotel is at the enabling works stage, and rock cutting and stabilisation is currently being carried out by Bumi Geo Engineering. The staff accommodation, comprising 13 buildings, is also under construction by GTGC. The structures for five out of 13 buildings are complete and 60 per cent of all structural slabs have been poured on site. Towell, the residential contractor, is working on three of the residential communities – Zaha, Nameer and Wajd – with the Zaha development currently 22 per cent complete and due for completion at the beginning of 2017. Saraya Bandar Jissah recently awarded the tender for designing and constructing a sewage treatment plant to Drake & Scull International, while KEO International Consultants will provide consultancy services.